Some rocks around high-temperature fumaroles are partially covered by small hollow spheres that form some kind of solid foam. The very thin and fragile walls of the spheres are made of a translucent polycrystalline material. The spheres are often distorted and may contain one or two spheres inside. The color varies, they may be blue, green, yellow or gray. Raman spectroscopy clearly detected sulfates, but the spectrum does not match a specific mineral because the spheres are very likely a mixture of different minerals - notice the yellow grains in the bright bubble in the front. During rain water dissolves sublimate minerals that cover the rocks in and around high-temperature fumaroles. The brines cool and penetrate the rocks and also dissolve minerals that have previously been mobilized and deposited inside the rocks. After the rain stops, the rocks get heated up again (even at some distance from a vent, the surface around high temperature fumaroles easily reaches 150-250°C), until the brines start to boil and are driven out of the rock. The boiling brines form a foam at the surface and the crystals start to grow in the bubble film while the water evaporates; more solution is driven to the surface and keeps the crystals growing until the rock is completely dry again. There are other foam-like aggregates on these rocks that are insoluble in water and that are not made of visible crystallites. These might be pseudo- or perimorphs morphs of the soluble ones. 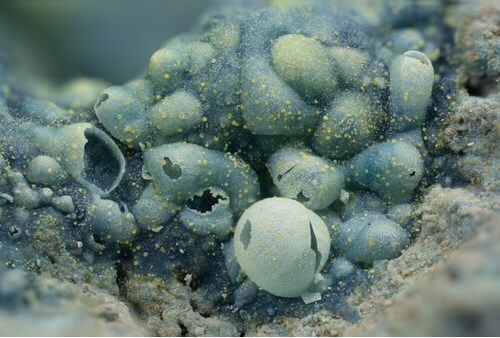 The blue color is caused by molybdenum blue ("ilsemannite"), the yellow spots could be either an iron sulfate, like copiapite, or sidwillite, a hydrous molydenum oxide. Found at the north-eastern inner crater wall of Iōdake volcano. Field of view 9 x 6 mm.